Micro-Box A.I.O NEW (All In One) V4.0.1.0 - News - MICRO BOX V3.0 THE BEST MULTI PLATFORM UNLOCKING TOOL ! 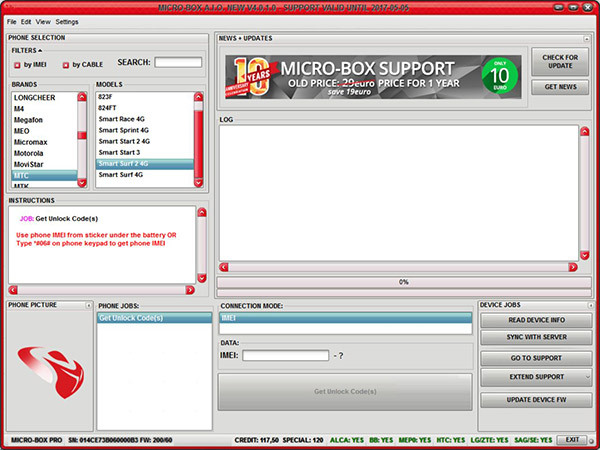 Micro-Box A.I.O NEW (All In One) V4.0.1.0 - 16.11.2016. - MTC Smart Surf 2 4G - WORLD FIRST ! - OYSTERS TH74HMI 4G - WORLD FIRST ! - SENDTEL MOBILE Rocket - WORLD FIRST ! - WIKO Lenny 3 - WORLD FIRST ! Price for 1 IMEI: 1 SPECIAL CREDIT! / Delivery time: INSTANT!